I’m drowning in notebooks. As I type, four of them are littered across my desk. A large, faux-leather covered notebook is sitting on my carpet, surrounded by little black dots that look like insects, but upon closer inspection turn out to be faux-leather droppings. There’s a notebook that permanently rides in my work backpack, another in my handbag, and a few more stockpiled in my writing box for good measure. So I find excuses to buy them. This one is for Novel A, I’ll tell myself. That one is for scribbling articles, and article ideas. And this one, the one I can’t stop running my fingers over, can be for, uh, mindmapping. Yes. Mindmapping. Because I do that a lot. Or will be inspired to, once I buy this notebook. Did I mention I’m very good at convincing myself? Not that I’m complaining, mind you. I’ve gotten cute little notebooks that fit perfectly into small handbags, hardcover ones with encouraging quotes on the pages, ones with beautifully artistic covers that are probably a lot more creative than anything that will ever go into them, and even quirky ones with the strangest, smoothest paper I’ve ever felt. Of course, I use all of them as well. Partly to avoid that awkward silence when the person asks me how I liked the gift–I want to show them that yes, a notebook for a writer was a great idea and look, I’m using it! (Which in turn means I get even more notebooks in the years to come… real smart, Leanne.) I have so many notebooks that I misplace them around the house and in various bags regularly. So when an idea hits, and I simply have to write it down now because the internet and my smartphone has ruined any aptitude I may have had for memorization, I grab the nearest notebook to hand. Come on, surely you can’t expect a creative genius to actually get up and do such a menial task as searching for a lost notebook? This means that I have random scribbling in just about every notebook I own. 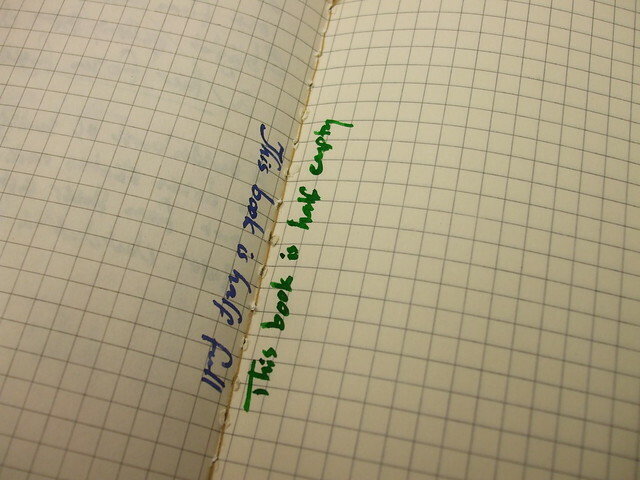 When I take out a notebook to use for its original planned purpose, It’s quite common that I’ll come across a phrase such as “Disappointed. Am I bald?” and wonder just what drug I was on when I wrote it. Forget about searching for a specific idea I had at some point–it’s better to leave it to God (or fate, or whatever you believe in) to present me with those ideas again at some random time in the future. Even so, I know the next time I see a notebook filled with beautiful paper, or receive yet another one when a special occasion rolls around, I won’t be able to resist. Though they’ll never be filled with the writings of a Hemingway or a C.S. Lewis–think more along the lines of a hundred monkeys on a hundred typewriters notebooks–they are physical, tangible objects of all that I dream (or hallucinate). They’re items I can hug and rub against my cheek and sniff. (Maybe that’s why there are so many strange ideas!) Their presence is an inspiration, a reminder of all the authors in the past who drew incredible tales from their heads with nothing more than a pen and paper. And to be honest, they really do go well with my fountain pen, inkwell, and wax seal.